Modified Ingredients | Eat. Document. Eat more. 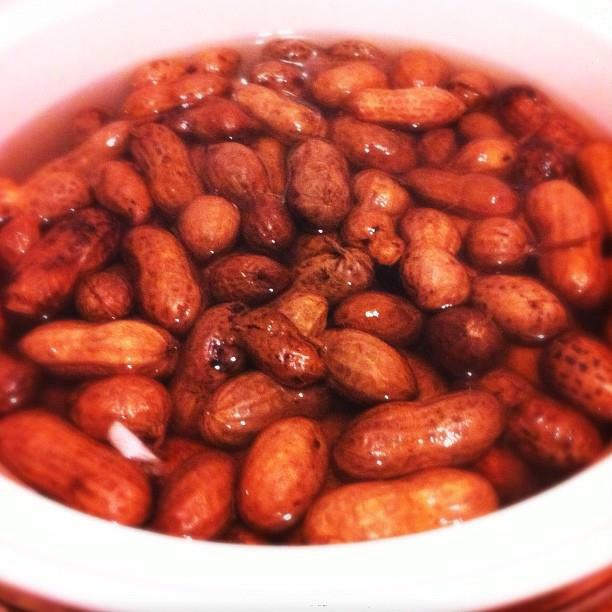 Boiled Peanuts were my favorite childhood snack. We’d get them from roadside vendors; farmer’s markets dotted the major roads in the town I grew up in and every market had large cauldrons of boiled peanuts simmering. Pull up in your car, get some produce and a bag (plastic inside of paper) of boiled peanuts. Some vendors would even give you a second bag for your shells. Convenience stores down South also had them, in regular and cajun, but it was never quite the same. Imagine my surprise when I moved to Philly and they were nowhere to be found. With some searching I managed to find the canned variety at select supermarkets, which do in a pinch but for my money, fresh is best. So today I threw a few pounds of fresh goobers into the crockpot with a little under 1/2 cup of salt, a handful of peppercorns and a few cloves of garlic. They’ve been slow cooking all day and are just about done. A little salty for a latenight snack, but when a craving hits you do what you’ve got to do! Claire and I tend to take a cooking hiatus during the summer; our kitchen is small and it gets hot quickly so we find that it’s easier just to grill outdoors or hit up our favorite restaurants while the summer sun blazes. We haven’t forgotten about documenting our culinary adventures though, so hopefully as the weather cools down the kitchen will heat up (without suffocating us) and we’ll have fun new content here on MI. That said, a few months ago I whipped up some ‘foie gras and pork heart stuffed’ squab. Tiny delicious pigeon stuffed with a rich, meaty paste of breadcrumbs, foie gras, ground and chopped pig heart, celery and onions and capped off with another slice of foie. Heavily salted and peppered, browned and roasted. 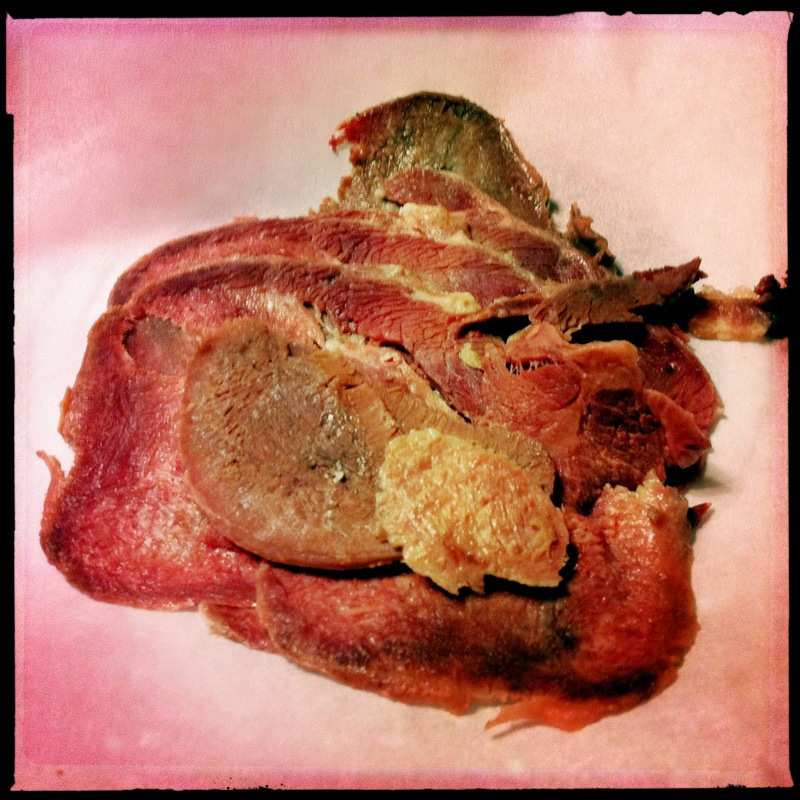 I’ve got a friend on the lookout for Deer Tongue for another corned tongue experiment, and curing season is upon us. I can’t wait to get back under the apron! There’s no way to photograph a Silkie without it looking creepy. 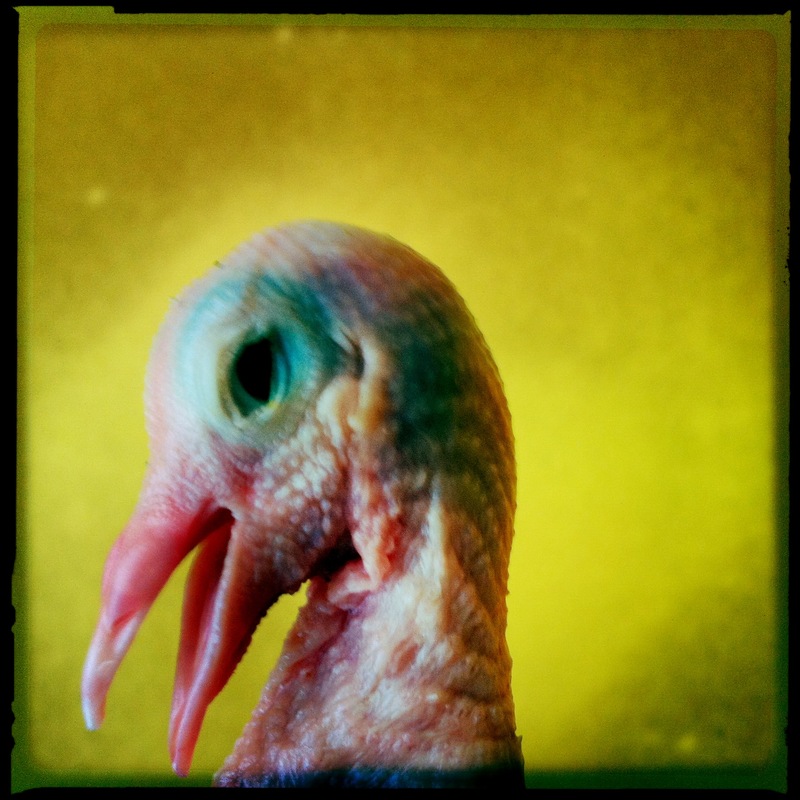 So I set up the lightbox and just sort of went with it. 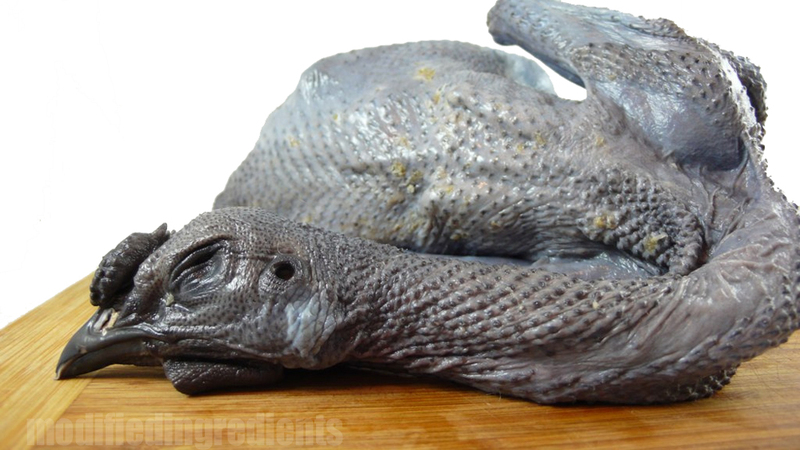 While it looks like a miniature dinosaur mashup (and I’m sure if you trace back the line of the noble chicken long enough, it might well be) that’s come straight from hell. But really. It’s just a chicken. A fancy chicken. Today was a day of kitchen-time for me. Cooked up a big veggie loaded lunch, then made a batch of pickled eggs (update in approx 3 weeks) followed by a “brinner” of Bacon, eggs and pancakes. After the washup, I cooked the silkie in my pressure cooker; making a dang fine stock in the process. Growing up, my Mom was big on chicken and yellow rice; so I used the silkie in a dish of saffron rice. The meat itself has a black overtone, but isn’t totally dark. Mixed well with the bright yellow of the rice, and the taste is roughly the same as a regular barnyard chicken. Overall a pretty fun fowl and really fun to be back in the kitchen doing projects. Hopefully my updates here will be more frequent! It’s been a while since we’ve posted; Claire has been busy with school and I don’t really cook excessive meals for just myself. Such is life. You do have to stop and smell the roses sometime, so I treated myself to a “French Kiss” from Di Brunos. 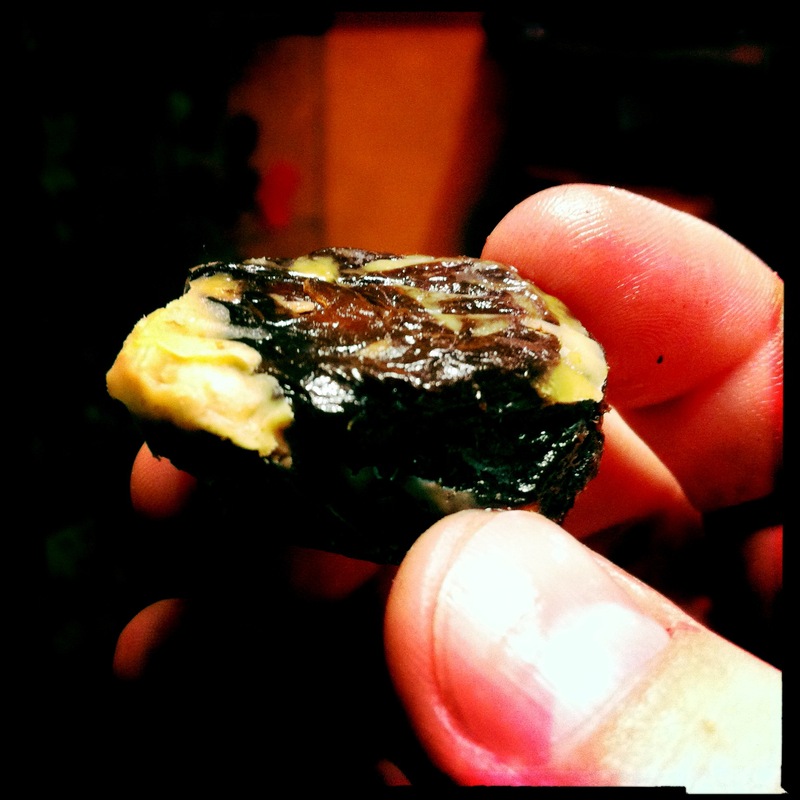 A cognac soaked prune cored out and stuffed with foie gras. Everything just came together perfectly. My brother Robert called me this morning reminding me that we had promised to go out to Hammonton, NJ and BBQ with our Dad; which could be an all day visit. My corned beef was entering it’s fifth full day in delicious brine and I wasn’t really sure how long I could safely leave it submerged. So… thinking quickly… I packed a stock pot, a bag of carrots and an onion and my deli slicer and hopped in the car with Claire. Who herself had packed a full compliment of baking supplies! Forty five minutes later we were in Hammonton, and as my Pop fired up the grill, started preparing for the three hour simmer. Aromatics chopped and stock pot ready, I had to fold the tongue to fit it in the Le Creuset stock pot; which caused a bit of an issue when the water finally came to a boil. Turns out cow tongues and heat don’t get along. Left alone, the tongue flexed in the pot and knocked the lid off! We let it simmer while we prepared dinner. And while we watched TV. And while we cleaned up. When it was finally done I dropped it into an icebath to stop the cooking. The outer membrane tightened up considerable and was much easier to peel off than I had expected. Once it was totally skinned (and a few pieces sampled) I put it back into the cooler pot liquor and stored it for the trip back to Philadelphia. When we got back to Xanadont, I fired up the deli slicer and shaved off a full sandwich worth of meat, which I put on spicy mustard smeared sour dough bread. Tomorrow I’m going to get some cole slaw fixins and pickles an try a different style sandwich. I was happy with how my first brining experience came out and thanks to my handy brine bucket, will most likely be soaking something again soon!